Well played cricket by England, who have played below par all series but still come out on top. Today saw some farcical captaincy and tactics by Smith and South Africa. They failed to attack England before or after lunch, and eventually set England a target of about 180 in 40 overs. Initially, I felt England would canter it – but they lost 3 very quick wickets, and had to be content to go for the draw. South Africa have declared on 296-6 at Tea on one of the most confusing, and tactically bereft days of cricket I’ve seen in a long time. There’s a suggestion that SA are more worried about slipping down a table in the ICC rankings than winning the game…find that hard not to beleive. Shall post thoughts later. Cameras surround Harmison’s home in Ashington, desperate to hear news of this momentus occasion: their son/husband/father Steve has taken a wicket for England. Yesterday, I commented how I thought it difficult to see how a result was possible in this game. 24 hours later and England have a distinct chance of winning, playing some outstanding cricket – their best day all series. Today was the day when the real England turned up. They had threatened to do so all series, but have been 80% at best – today they exceeded themselves. Thorpe and Flintoff batted very calmly and patiently – hardly scoring over 2/over – but both walked back to the hut at lunch. After lunch, Flintoff showed why he’s such a crowd favourite in England by going from 30 to 77 in quick time. Both were out quickly, and Geraint Jones played a memorable knock of 50 (and another 50 partnership with Giles who, incidentally, is averaging around 25 with the bat this series)…a gem of an innings from only 52 balls. He is a fine & destructive player when on song, and South Africa are lucky that this was only his 2nd 50 of the series. This all meant England had a lead of 112 – not what South Africa had planned at all. After his innings of 77, he opened the bowling and produced yet another superb bit of cricket. Man he’s a terrific cricketer! Gibbs was unlucky to be given caught-behind, but Hall – bizarrely promoted to 3, presumabely as a pinch-hitter – was clean bowled to leave South Africa trailing by 53. They are, in effect, minus 53-2 going into Day 5. 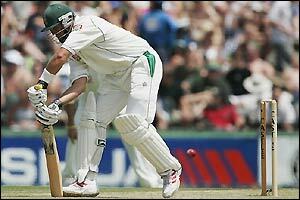 The way Kallis played (19 at a run a ball) suggested he was frustrated and demoralised – even he, the great Kallis, took very risky shots…South Africa MUST just knuckle down and beleive they can draw it. England, rightly so, beleive they can win this series 3-1. South Africa look a team in shock. Before England arrived, South Africa refused to concede they could lose against them. I don’t think they took England’s status as 2nd best side in the world seriously but now, in this 5th Test, they look tired and jaded and disillusioned. Odds on for a draw unless England can snaffle out 2+ before lunch. Either way – only a miracle will save SA from losing this series. Not since 1964/65 has England won a series in South Africa, and only Australia has beaten them at home since their return to international cricket in 1991. Terrific, old-fashioned play by England today not losing a wicket before lunch. Flintoff’s just made an impressive 50 – the last 15 of those came very quickly, but before that it was defence defence defence. Again, South Africa don’t look like they beleive they can win. Thorpe on 80 and these 2 have made the 7th hundred partnership in this series (by England). South Africa…only 3, which is perhaps the difference between the two sides. …decisions take so long in Cricket. The players came back onto the field for one over. 6 balls. 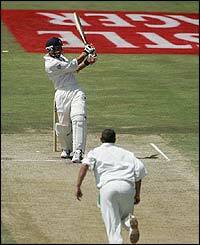 Strauss couldn’t pick up the ball at all. Umpires appeared to offer the light to the batsmen who rightly took it (as any batsman would), but they didn’t take a light reading. Off walk Strauss and Thorpe. Smith and South Africa stayed on the pitch, wondering what was going on – then spent a couple of minutes looking at the stump camera’s cable to see if the ball would go underneath it! What the hell’s going on? Vaughan at the Wanderer’s was fined his entire match fee – 100% – for asking for consistency in offering the light to batsmen. It’s an utter farce and the umpires must be held responsible, especially Bucknor. I don’t think this clause has been used all series. Certainly not at the Wande I don’t think the umpires are interpreting this rule correctly. It is my understanding that the light’s quality during a Test match is “tested” at various intervals. For argument’s sake, let’s say good/excellent light equals 10. At 4pm it starts to get gloomy, and the umpires re-test the light which comes to 8, a minor reduction. Why can’t there be a standardised format, which would introduce much better consistency, for light metering? If the light falls below X, take another reading. If it then falls further to Y, offer the light and don’t come back on the park until it reaches X. Another suggestion: how about having a light meter embedded in the stumps? This would be accurate, and constantly monitored by the 3rd umpire. It could even be relayed to “The Big Screen” for spectators to see? I suppose the argument against this could be it could cause a tactical change in captains, who would be able to see whether the light was decreasing (but – they’ve got eyes, they can see the bloody light anyway). Post your thoughts if you have any. England haven’t batted great so far today, before a thunderstorm brought the players off, but it’s been gripping viewing, not least listening and watching Andre Nel (henceforth to be known as Nelly the Elephant). England are 79/3 with both Strauss and Thorpe batting with toothpicks – although Strauss was starting to find the middle before they sprinted for cover. Nelly has caused minor uproar if the emails to Sky (broadcasting the cricket) is anything to go by. Lots of Parents saying how disgusted they are by his histrionics, and what a bad example he’s setting. I can’t say I disagree entirely – I’m in favour of aggressive cricketers, but only if they have a justified reason for doing so. (Donald v Atherton 1998. McGrath v Anyone. Great bowlers are allowed to). Nelly is all talk – he bowled some reasonable deliveries, but nothing England should concern themselves with. His follow-through is unbeleivably ridiculous – within a couple of feet of the batsman, and he effs and blinds like a maniac – whether he’s been hit for four or gone past the outside edge. It’s all for show, and makes him look very daft. I also still can’t work out his action – he’s nearly bowling off the wrong foot, chest-on! Try it at home (if, like me, you phantom-bowl in your living room off 2 steps) – it’s impossible. Back to the game, and it’s difficult to see a result happening in this game. The thunderstorm pelted rain down and they’re waiting for it to dry. It’s day 3 today, and England trail by over 150 – they’d need to chase down South Africa’s total and get a lead by close of play tonight, but are 3 down with the Saffers bowling quite well. Lots of great stuff in the papers today which I’ll go through later. Read this on Mike’s blog (thanks Mike) and laughed at his pontification of Lee in the movies. God…can you imagine? Thanks to the CC blog, I found this article by Viv Richards on Australia’s dominance and of their chances in the 2007 World Cup. Yet again, England got themselves into a hole – yet again they find a couple of spades and dig themselves out. In fact, they dug themselves out and threw South Africa into the hole – a great final session saw them slump from 197-4 to 247-9. England showed what they should have bowled in the first session, both Jones and Flintoff really finding their lengths. South Africa have this nack (knack?) of losing key moments in a day’s play. Despite England’s poor showing in the first 2 sessions, they’ll be pretty pleased to have nearly knocked them over inside a day. Already onto day 3 tomorrow, so hopefully there’ll be some enterprising batting from both sides in the last 3 days of this series in order to enforce a win.